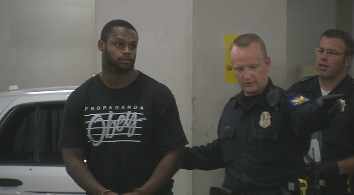 PHOENIX -- Arizona Cardinals running back Jonathan Dwyer was released from jail early Thursday after being arrested on aggravated assault charges in connection with two altercations at his home in July involving a woman and their 18-month-old child, the latest in a string of such cases involving NFL players. CBS affiliate KPHO-TV reports that Dwyer spent Wednesday night in jail after he was arraigned and was released about 5 a.m. Thursday morning on $25,000 bond. He mumbled something to reporters, and when asked if he would play football again, he said, "I will." He then got into a taxi and was driven away. Dwyer, led to the jail in handcuffs on Wednesday, was charged with three counts, including "aggravated assault causing a fracture" involving the unidentified 27-year-old victim. The Cardinals say they first learned of the domestic abuse accusations against Dwyer on Wednesday afternoon. By evening, citing "the serious nature of these allegations," the team had deactivated Dwyer from all team activities. The quick reaction came with the backdrop of intense criticism of the NFL's handling of a spate of such cases. Police said they were carrying out a search warrant of Dwyer's residence in pursuit of more evidence. The 25-year-old player denied committing any assault, police said. Authorities depicted a stormy relationship between Dwyer and the woman that escalated into violence on July 21, four days before the Cardinals reported to training camp. Neighbors heard a fight and called police, who showed up at the residence but left without making an arrest because Dwyer hid in the bathroom, and the woman said she was the only one at the home, Sgt. Trent Crump said. The next day, Crump said, Dwyer snatched the woman's cellphone and threw it from the second floor of their residence to prevent her from calling police about another dispute. Crump confirmed there was an allegation that Dwyer threw a shoe at or toward the couple's 18-month-old son. Crump said he couldn't elaborate on it. Crump said the woman moved out of state with the child, but came forward last week and provided police with information about her injuries and text messages indicating Dwyer "was going to harm himself because of what had been going on." The NFL has been jolted by domestic violence issues since a videotape surfaced that showed former Baltimore Ravens running back Ray Rice knocking out his then-fiancee in an Atlantic City, New Jersey, elevator. On Wednesday, the Carolina Panthers decided that star defensive end Greg Hardy won't play any more games for the team until his domestic violence case is resolved. Hardy was convicted of assault on a female and communicating threats after the victim said the 6-foot-4, 275-pound player threw her in the bathtub and onto a sofa covered with guns before threatening to kill her. Hardy is appealing the ruling. This is the second domestic violence case involving a Cardinals player. Inside linebacker Daryl Washington pleaded guilty to assaulting his ex-girlfriend and is serving a year of supervised probation. Washington hasn't been penalized by the NFL for the offense but is suspended for this season for violating the league's substance abuse policy.